Mr. Quickstep, accompanied by his dog Foxtrot, is looking for the future. On the way, they meet up with Coppernickel and his dog Tungsten. Coppernickel says there's no need to look for the future, as it will arrive anyway. Mr. Quickstep disagrees, for the future he's after hasn't even been thought of yet. 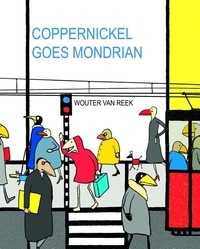 Left behind, Coppernickel worries that he will miss out if he doesn't follow Mr. Quickstep, so he sets off with Tungsten. Naturally, Coppernickel and Mr. Quickstep bump into each other again, which allows Mr.Quickstep to fling open the door to the future by showing Coppernickel his last, most modern work. What stands out here is how Mr. Quickstep's attempt to find an abstract essence in the very stuff of reality is woven right into the illustrations of this graphically distinguished work, giving children the sense that the future is theirs to create as they see it. Dreams can become reality and in the process we too will be transformed. Wouter van Reek went to art school, which was too easy, so he changed to mathematics, which was too hard, so he changed back to art. After art school, he created an animated cartoon series for TV, introducing Keepvogel (Coppernickel) and Tungsten, a super bird/dog team. Wouter has created numerous animations and books about these famous and beloved Dutch characters.